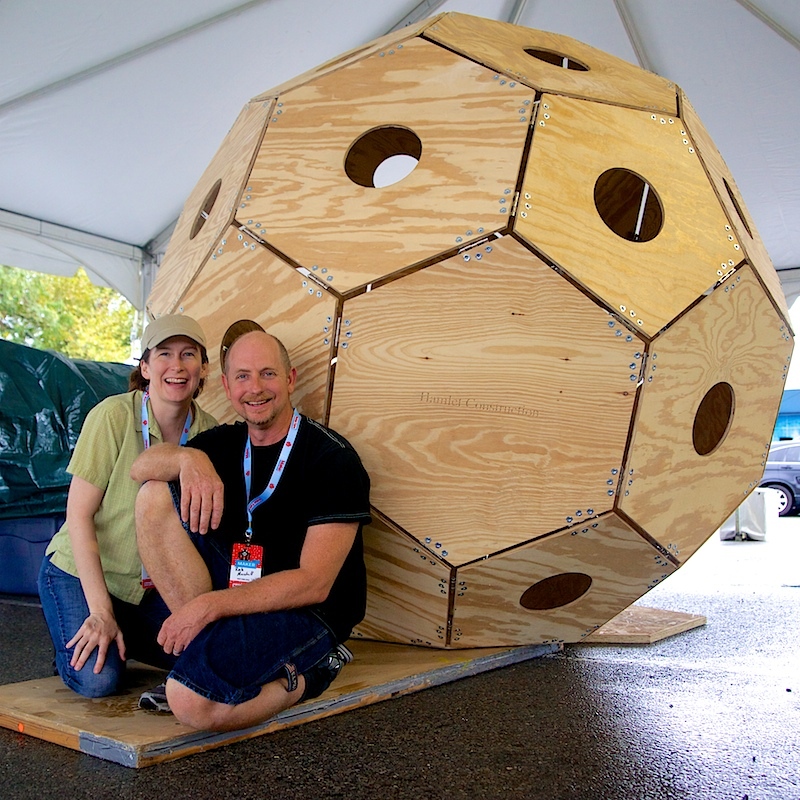 Image courtesy Hamlet Construction, inc.
A truncated icosahedron is an Archimedean solid, one of thirteen convex isogonal nonprismatic solids whose faces are two or more types of regular polygons. It has 12 regular pentagonal faces, 20 regular hexagonal faces, 60 vertices and 90 edges. Rob told me that his inspiration was straight from Archimedes and the design begged to be conquered by him. The final product really was truly awe inspiring. 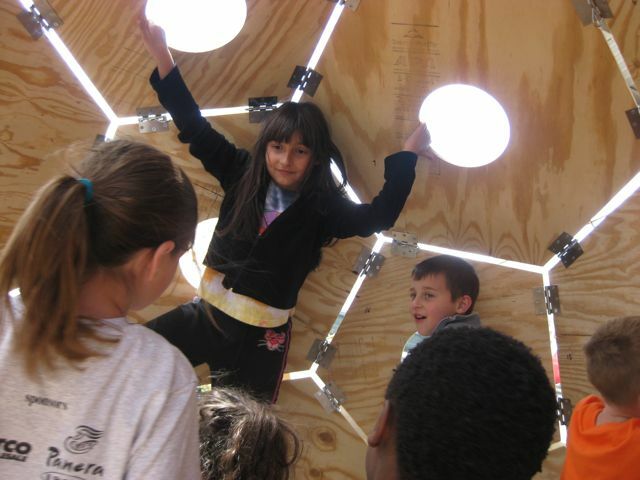 Standing seven feet six inches, the spinning truncated icosahedron gave kids and adults a spinning ride worth remembering. 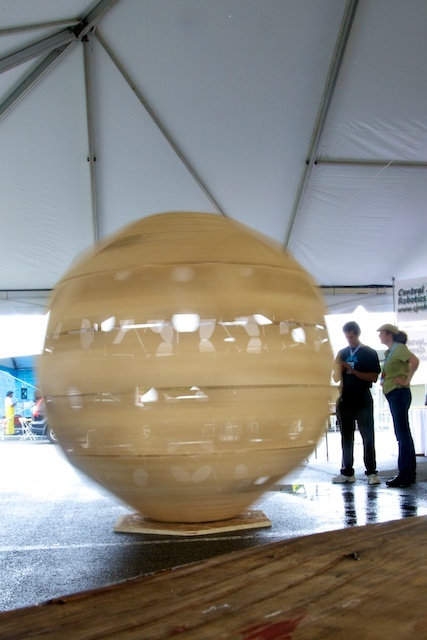 As I was taking my ride inside this wooden soccer ball, I played around with the physics of the spin and realized that the spin could be manipulated via the law of angular momentum conservation. The closer you are to the center point of the ride, the faster it will go, and the further you are from the center point the more it will slow down. Picking your sitting or standing point is also one of the most important ways to avoid dizziness while onboard. If you get a great position the ride is spectacular! If that was all this gem could do, it would be enough, however Rob explained that he designed the entire structure to be safe for kids to climb in. This feature is particularly useful when, after spinning the sphere for hours to give everyone a ride, Rob is in need of a break. I personally saw 12 kids inside the dome at one point. I was so impressed by this ride, and the fact that it was built by a single enthusiastic maker, that I even offered to make them a promotional video. If you would be interested in making your own paper replica of a truncated icosahedron, the folks over at Gijs Korthals Altes have designed a printable pattern. 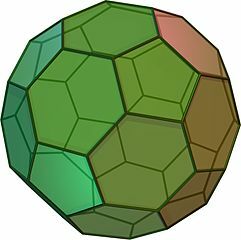 Other places to find a truncated icosahedron in “nature” are on soccer balls, radar domes, and the rhinovirus (a common cold! ).